Watch the video below (please wait for a couple of seconds for loading). 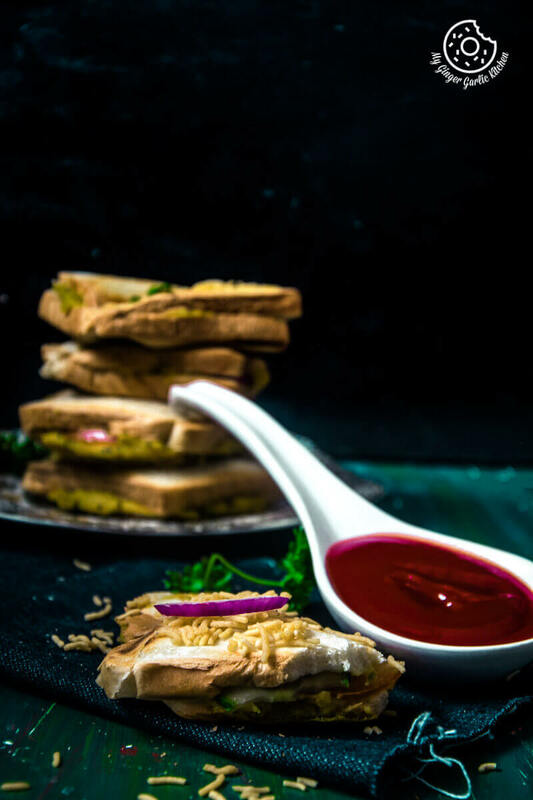 Bombay Masala Toast is a classic, crispy, tasty, and a quick snack, and making this is very easy and simple. Saturday, 7:30 am: Adoria wakes up and comes to me. Mommy, I want to sleep in your bed for 5 mins. I let her come and we cuddle under the blanket and soon after she falls asleep. I tell to Daddy dear to move in the middle because I just can’t sleep when I am in middle. I need some space on one side of the bed. So Daddy dear moves quickly and we all sleep like babies. 10:00 am: We all are awake now. And now I see that Adoria’s cough has gone worse from last day. And I asked to Daddy dear how’s he feeling. He says he can feel something in his throat too. Well, I am also not feeling very well, because of that cough inside my throat which is bugging me all the time. So, all in all, we all are not in the mood for something fancy. So we go for cereals and milk. Then I pour a steaming cup of coffee for myself and it sure helps. 1:00 pm: I see some boiled potatoes in the refrigerator and some green chutney as well. I ask to daddy dear if he wants to eat sandwiches for lunch. So he eagerly says yes and there I make some spicy masala toasts for daddy and me, and some non-spicy toasts for Adoria. 1:30 pm: We all are enjoying our lunch of this delicious toasts. And soon after we all jump to couch with our respective warm drinks and enjoy this slightly sick-feeling day along with Adoria’s favorite animation movie, ‘FROZEN’, which she wants to watch all the time. Today (Monday), 7:50 am: Adoria is still not feeling very well, and the same for me too. That’s why we decided to stay at home today. 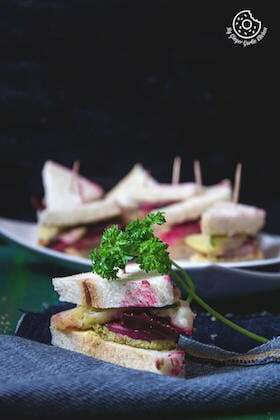 So here I come with the very simple yet most delicious potato sandwiches which I love to make most of the times. You might be aware of the fact that the financial capital of Bombay aka Mumbai is quite famous for its street food. 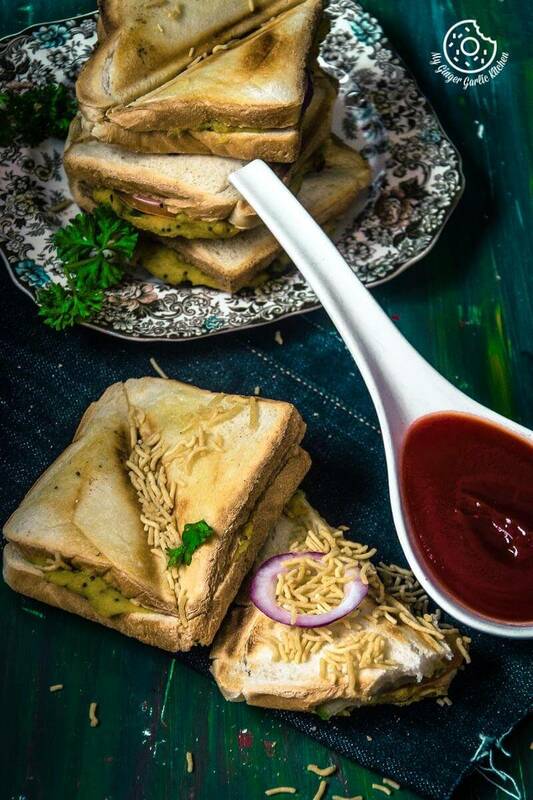 The masala toast I am sharing today is also a street food which hails from Mumbai streets. It’s originated from Mumbai but I guess it is sold in every city of India. But I can be sure about my city where I grew up eating this yummy Toast. 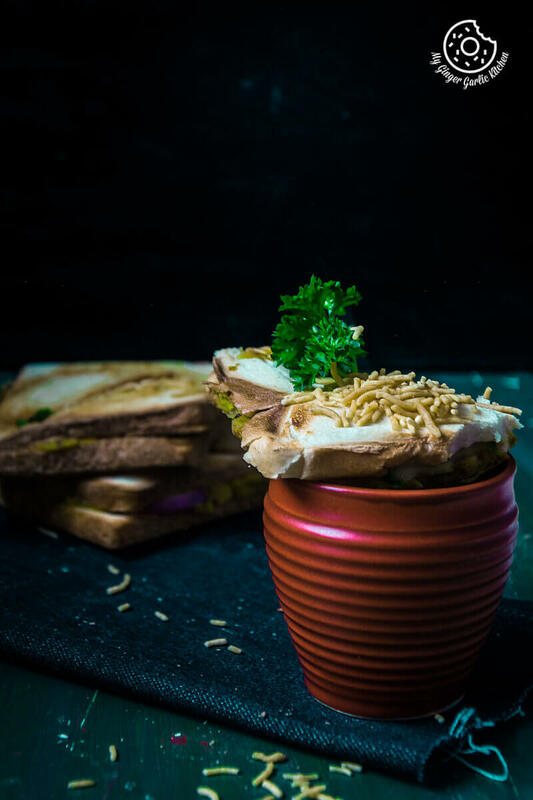 The potato stuffing which is used for making this toast is quite similar to vada pav stuffing. 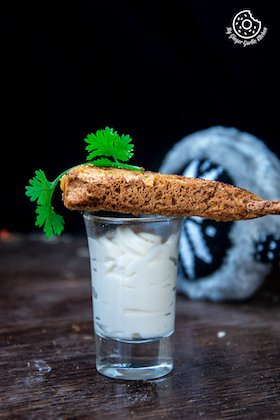 This toast can satisfy you instantly and you won’t feel hungry for a few hours. 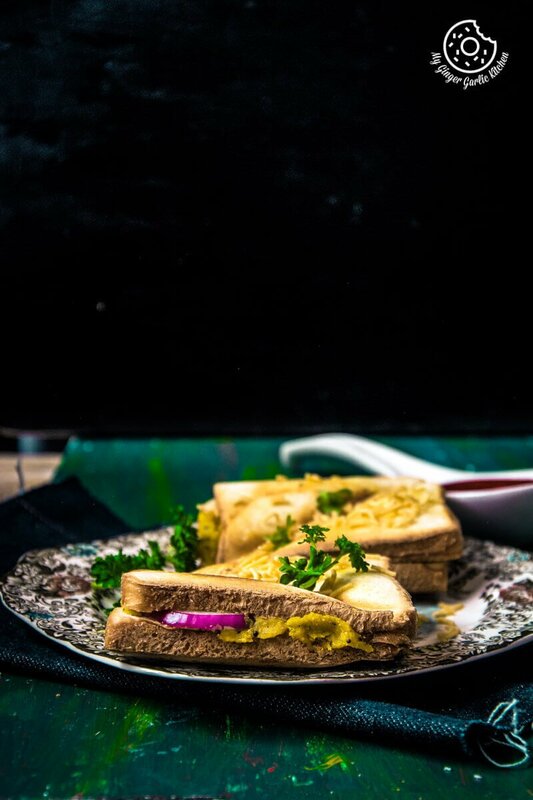 That lip-smacking aloo masala is stuffed between the two slices of bread which are smeared with butter and tantalizing green chutney. Typically, the roadside kiosks toast it in a sandwich maker which is put directly on the flame. But the good news is that you can make this yummy thing in an electric sandwich maker too. This is what I do. 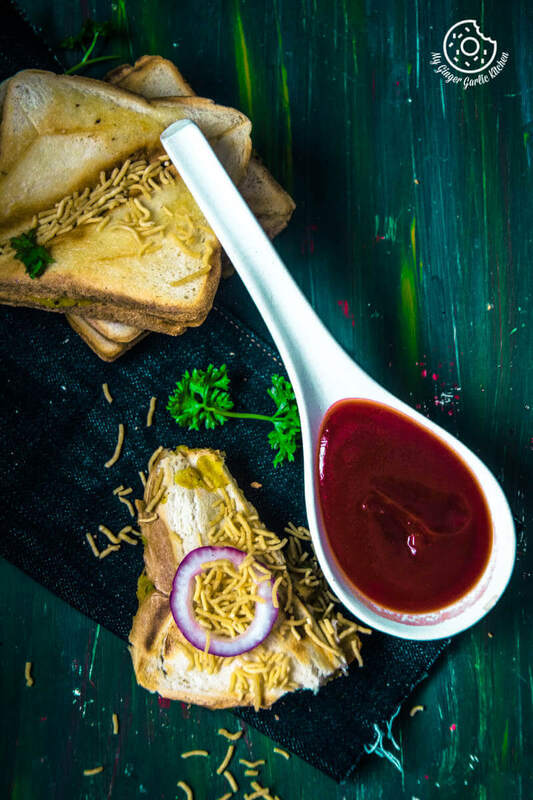 After toasting, the good amount of butter is smeared on hot toast and sprinkled with crunchy sev and served with some tomato ketchup. Heat a pan, and add the cumin seeds, cloves, fennel seeds, star anise, cinnamon, black peppercorns, and dry roast on a low heat for 3-4 minutes. Let it cool. Grind it well to make a fine powder. Add black salt, dried mango powder, and salt to it. Mix well. Sandwich masala is ready. You can store it in an air-tight container. Add mustard seeds. When start to crackle add green chilled and sauté for 2 minutes. Add coriander powder, turmeric powder and sauté low heat for about a minute. 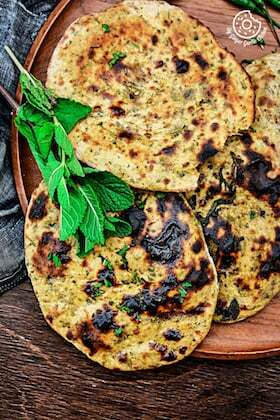 Add mashed potatoes, salt, chopped coriander leaves and mix well. Let it saute on a low heat for about 3-4 minutes. Turn off the heat and keep this stuffing aside for about 7-8 mins. Spread butter evenly on 4 bread slices. spread the potato stuffing on 2 bread slices. Top with onion slices, tomato slice, and cucumber slices. Sprinkle with some sandwich masala powder. 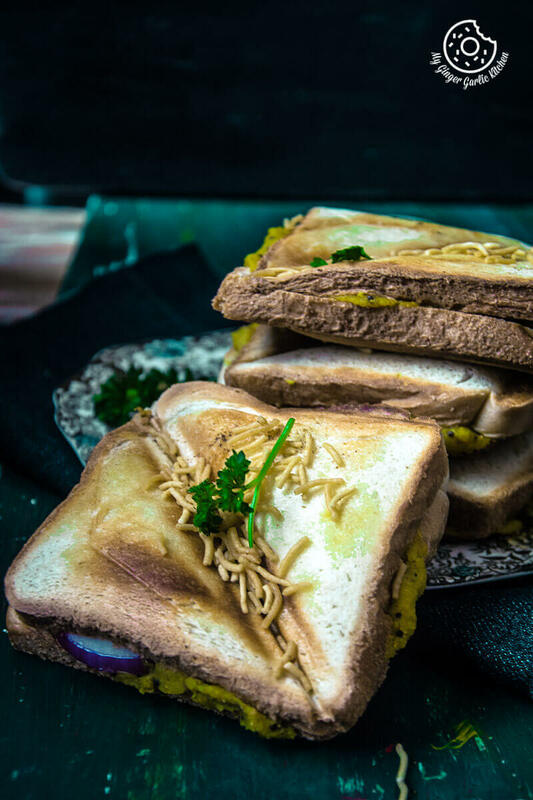 Toast the sandwiches in a sandwich maker as per the manufacturer’s instructions or grill them till they are nice, crisp and golden. Repeat the same with remain bread slices. Spread some butter on top of the hot sandwiches. 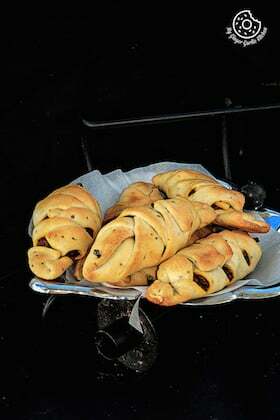 Sprinkle with some sev and serve hot with tomato ketchup or green chutney.